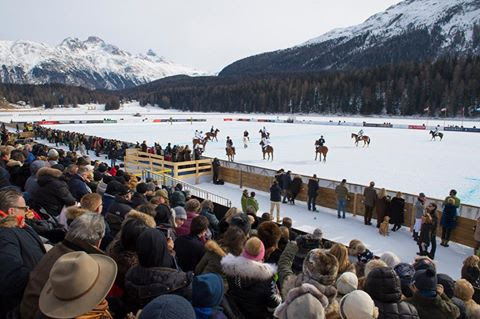 The scenic backdrop and frozen lake for the St. Moritz Snow Polo World Cup. ST. MORITZ, Switzerland—January 25, 2018—Badrutt’s Palace Hotel, runners-up to Cartier last year, will be among favorites when the 34th annual St. Moritz Snow Polo World Cup Tournament gets under way Friday. The foursome of Melissa Ganzi, 8-goaler Alejandro Novillo Astrada of Argentina, 6-goaler Juan Bollini and 2-goaler hometown favorite Tito Gaudenzi will represent Badrutt’s. Ganzi, the USPA Florida Circuit Governor and president of Grand Champions Polo Club, will make her third appearance in the only high goal polo tournament played on snow. Two years ago Ganzi was the first woman to compete in the snow polo tournament since its inception in 1985 and last year she was the first woman to make it to the championship final. Ganzi, Novillo Astrada and Gaudenzi are coming off winning the title for Bendura Bank at the Kitzbuhel Snow Polo World Cup two weeks ago. Novillo Astrada was Most Valuable Player. In last year’s St. Moritz event, Cartier's team of Rommy Gianni, Charlie Wooldridge, MVP Chris Hyde and Dario Musso reclaimed the coveted Cartier Trophy with a 7-4 victory over Badrutt's Palace Hotel's Ganzi, Novillo Astrada, Gaudenzi and Jesse Bray. Two years ago, Team Maserati knocked off defending champion Cartier. The world’s most prestigious polo tournament on snow was the first snow polo tournament in the sport’s history created by polo promoter Reto Gaudenzi, founder and CEO of Snow Polo World Cup. It's held against the scenic backdrop of the breathtaking mountains of Engadine. "We are proud to be able to stage another top-rate event, presenting both social and sporting highlights to our guests and spectators," said Reto Gaudenzi. "We owe this to our loyal sponsors, partners and players, and their continued trust in us." 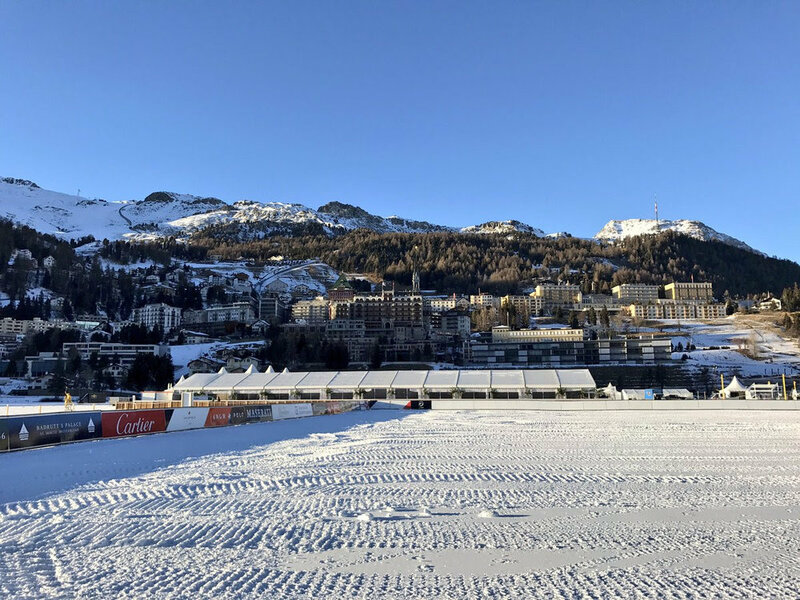 Four high goal teams with players from the U.S., Argentina, England, Italy, Azerbaijian, Russia and Switzerland will compete for the coveted Cartier Trophy on the frozen lake of St. Moritz. Two women players, Zhanna Bandurko and Raya Sidorenko, making their debut, will split time as captains for Team Maserati. Team Cartier (16): Rommy Gianni, 1; Juan Cruz Greguoli, 4; Dario Musso, 6; Chris Hyde, 5. Team Azerbaijan Land of Fire (16): Rashad Hasanov, 2; Eichin Jamali, 3; Lala Laplacette, 5; Adrian Laplacette, Jr., 6. Team Badrutt's Palace Hotel (16): Melissa Ganzi, 0; Juan Bollini, 6; Alejandro Novillo Astrada, 8; Tito Gaudenzi, 2. Team Maserati (17): Zhanna Bandurko/Raya Sidorenko, 0; Gerardo Mazzini, 6; Hissam al Hyder, 6; Robert Strom, 5. The umpires will be Oliver Ellis, Tim Keyte and Marcelo Garrahan. The always-entertaining Jan-Erik Franck will announce the action. On Thursday, teams will go through training sessions at the lake before the team and sponsor presentations at the Kulm Hotel. The first two days teams will play qualifying games. On Friday, Badrutt's Palace Hotel plays Cartier for the Winston Cup followed by Maserati playing Azerbaijian Land of Fire in the Carlton Hotel Challenge. On Saturday, Maserati plays Cartier for the Maserati Cup followed by Badrutt's Palace Hotel against Azerbaijian Land of Fire in the Deutsche Bank Wealth Management Challenge. The highlight of the day is the Snow Polo Night Gala Dinner Baku Moritz Night at Badrutt's Palace Hotel, located in the center of St. Moritz. On Sunday at noon, teams play for third place and La Martina Cup before the championship final at 2:15 p.m. where the two finalists compete for the Cartier Trophy. The three-day tournament has a backdrop of the snow-capped Engadin Valley and is the social event of the season. Social events will be held both on the lake and St. Moritz first-class hotels. Local chefs offer a wide array of culinary delights. Since the tournament’s inception, admission to the event has always been free including access to the grandstand. The lavish VIP tent is expected to be sold out. Last year a record 12,000 spectators attended the three days of the tournament. The tournament will be live streamed on the event's Facebook page. There is also Snowpolo TV 2018 features on the page.